So after the worst two consecutive losses since the Dakich era, you had to think that the Falcons were hungry for a victory, at home. Pretty much needed a victory. It does not matter if it was the worst offensive team against the worst defensive team...BG needed a win in this one, no matter any qualifiers. And they got it. And they got it in a relatively coasting fashion. BG never trailed. They were up 8-0 and put the lead over 10 with 12 minutes left in the first half. BG's lead never fell below 10 for the remainder of the game. In the 2nd half, BG's lead was as high as 23 and as low as 14. I know Coach was upset that we didn't continue to build the lead, we also didn't blow it. For my money, if you have a big lead and the other team never gets it inside 10 (much less 14), you remained in control of the game. In the worst/worst match up, it was the worst defense beating the worst offense. OU is really struggling on offense, but BG also played much more consistent and energetic defense, especially in the first half. 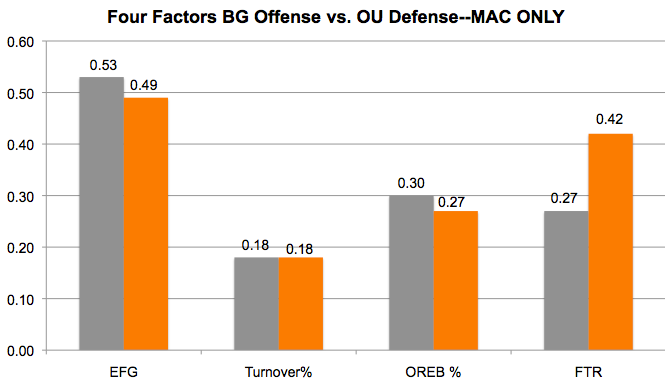 Remember, we were worried about OU taking advantage of BG's struggles defending the 3-point line. OU was a woeful 2 of 17 from 3FG. The .71 points per possession for OU was the lowest for a BG opponent since Morgan State last year. Their 34.5% EFG is the lowest for a BG opponent since Cleveland State the year before. 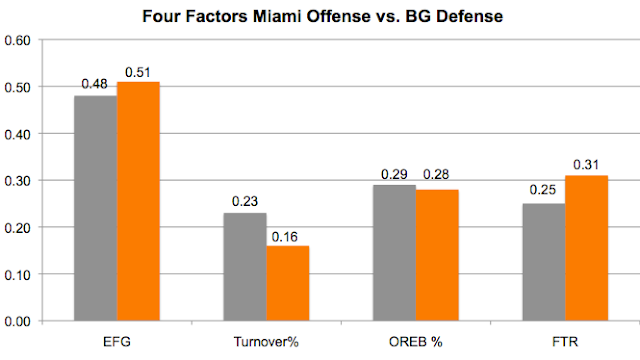 On top of that, BG did a great job closing possessions out by getting defensive boards. That's a lot of one and done possessions. BG did not do much offensively either. They struggled to shoot, took decent care of the ball, had a very average day on the offensive boards and, most telling, did not get to the line very much at all. After some bench time at UT, Wiggins was back with a double-double. He had 18 points on 8 of 15 shooting, 11 rebounds and....5 turnovers, which is a problem. BG seems to understand the importance of feeding Wiggins in the post but seem to lack the ability to do it consistently and effectively. Lillard scored a rough 13 on 4 of 12 shooting but also had 8 rebounds. No other Falcon had 10 points, though Plowden had 9 2nd half points on 3 of 5 shooting and 6 rebounds. Derek Koch had 7 points and 6 rebounds in 156 minutes. A couple lineup notes. Lillard started for Caldwell. John Wagner said that Caldwell was injured in the UT game, which Caldwell took to twitter to directly deny. Frye ran the point for much of the game. He's continuing to struggle with his shot big time (2 of 7/0 of 3) and had 3 assists and 4 turnovers on the point. Coach said that he did a good job organizing players and getting them where they needed to be. BG is now 4-5 in MAC play at the halfway point. They'd probably play at home for the MAC if the season ended today. Now, BG has two games with Buffalo left. Saturday they have Kent at the Stroh. Kent is on the rise. They are 6-3 in MAC play and have won 5 out of their last 6, including a win over Buffalo on Tuesday. Hopefully, they will come to BG reading the press clipping. And the beat goes on. Conference basketball is tough, game after game, with no breaks and no bye weeks. You lose Saturday night, you have two days and then you're back at it and when you're BG, there are currently literally no teams that you can count on beating. Every game is uphill. The Falcons are playing poorly, as poorly (over the past two and a half games) as they have in years. You gotta figure things are going to turn around at least a little. They have two games this week at home, which should help, although we haven't really seen that too much this year. OU is on an off-year, despite being a consistent MAC power. Antonio Campbell graduated and then Jaaron Simmons transferred to Michigan (where he is playing 8 minutes a game) and they were left with much less talent than expected. They are 9-11 and 2-6 in the MAC, and have lost 5 out of their last 6, with the only win being @EMU. They also beat NIU at the Convo. They have a loss to Buffalo in addition to UT. BG lost big to OU last year, both times. One was by 24 at the Stroh during the suspension game and then by 20 at the Convo later in the year. Nevertheless, this would appear to be an opportunity to get a win. However, as we always say, OU feels the same with us on the schedule. So here's the deal. OU is literally the worst offensive team in the MAC and BG is 11th in defense. So something has to "give." Who's worst will be better? On the other side, BG is 10th in offense and OU is 6th in defense. BG has to begin to play better on both sides of they ball or they aren't going to beat anyone. On offense, OU does very little well. They are 11th in shooting, 10th in turnovers and 12th in offensive rebounding. BG is a little more concentrated in its poor play. They are 12th in defending the shot, but are 6th in allowing turnovers and 4th on the offensive boards. In other words, the key here is for BG to find some way to defend the shot--as in, not allowing 13 consecutive scoring possessions--and they can keep OU off the scoreboard. 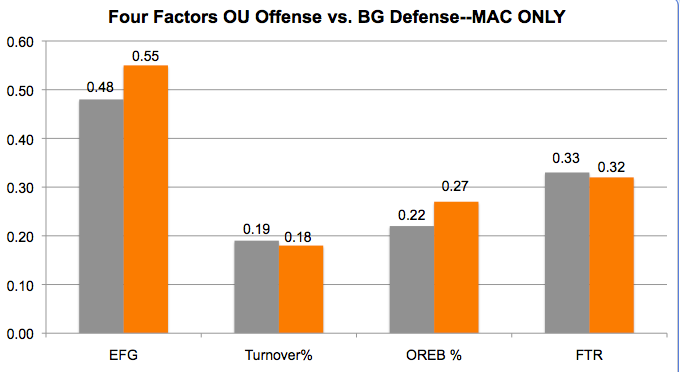 In a worrisome trend, OU doesn't try a lot of 3FGS--10th in the MAC--but they do make them---#2. Somehow, I think they are going to be trying a few more 3s than normal. They are dead-last in 2FGs. Also, they are #8 in FT%. Flipping things around, the biggest issue here will be at the FT line. OU has done a great job keeping teams off the line and BG relies on it, so that will be a test. Other than that, they are #7 in defending the shot, #7 in forcing turnovers and #9 allow offensive rebounds. BG needs to start to make some shots against all defenses to get back into a winning mode. Teyvion Kirk, a freshman, leads the Bobcats in scoring in MAC games, with a rough 14.9 on 42% shooting. He also averages 5.4 RPG and 2.6 APG. He's 6'3" and a strong contender for freshman of the year. Mike Laster is the second-leading scorer at 14.3 PPG on 45% shooting and 44% from 3FG. He's a 6'5" Sr. G. Jordan Dartis is averaging a rough 10 PPG, shooting 41%. Doug Taylor, a 6'9" JR leads the team with 5.5 RPG and 6'7" swingman Gavin Block leads the team with 3 assists per game. One thing that will be interested to see will be whether BG changes the starting lineup, something that Coach Huger intimated in his last game. The most likely scenario would be Plowden starting for Frye or Koch. It would also not surprise me if Lillard got the nod in front of Frye. Obviously, something has to be shaken up because this team is better than we have seen over the past two+ games. BG picked up a verbal commit for the February 7, 2018 signing day. It is a young man named Cameron Stage, who attends Cardinal Gibbons HS in Ft. Lauderdale. He's 6'4" and 295 who played T. There's not a ton of information out there on him, but this article from Miami says that he was "easily" one of the top o-line prospects in S. Florida. His team was very successful and made a run into the Florida playoffs. The other player is Mason Lawler, who came from St. Ed's in Cleveland and is, as you can see, a punter. BG has a top JUCO punter coming into this class, but that's just for a couple years. He took an unofficial visit to MSU. This post from Kohl's (the kicking camp) says he is the #4 punter in the nation. Welcome to the Falcons, Cameron and Mason. Can't stop looking at this....excellent story from John Wagner just posted. Give Huger credit...he's pretty blunt. Read the article. Key quote: "The starting lineup is next." Honestly, you could probably find 10 "superlatives" to rank the game. I put some up last night, here are a couple more. BG last allowed 100 in a regulation length MAC game was against Ball State in February of 1998, the first year Dan Dakich coached the Falcons. That was a home game. Per the Blade, UT hasn't shot that well in 15 years. 15 years. It is the biggest winning margin for UT in the rivalry. The last team to get more than 1.44 points per possession against BG was Xavier in 2010. At least we didn't have to hear that the issue was overconfidence. For the NIU game, I didn't put the stats chart up because, you know, it looks exactly like you'd expect it to look. But for this one, here it is. It's actually not as bad as you would think. BG had a slightly average offensive night, but you never know how much of that was the fact the game had been over for so long. (Kenpom says UT hit 99% win probability with about 3 minutes left in the first half. That shooting though. Ouch. Also, they came in as a poor offensive rebounding team and they had a big day doing that and usually it was a dunk put back. Think about this....they hardly missed at all and more than one-third of the time they did, they got the board. There were a couple positives. Coach had high praise for our "young" guys. Not sure who that refers to....is Dylan Frye included in that, for example? Freshman Daeqwon Plowden represented, that's for sure. He had 11 points in 18 minutes on 4 of 7 shooting. Freshman Derek Koch had 13 points in 21 minutes after not starting for the first time all year. He shot 4 of 8. Both players had four rebounds. Justin Turner struggled to shoot but had 6 assists on BG's 22 baskets scored by people other than him. The thing about this "young guy" thing is it worked better when he was struggling with the Orr/Jans refugees, but now that all the players came with Huger it's a little tougher to accept. Anyway, BG gets two home games next week to try and reverse this slide. OU and Kent. Both should be beatable at home, but we've not played well at home and right now are nowhere close to winning a MAC game. Let's hope it comes around. Coach Herb Brooks once said his team was playing "worse every day and right now they're in the middle of next month." That phrase would be very apt for the BG Men's Basketball team after they headed into Savage Saturday and were just completely embarrassed, losing 101-75 to their arch-rivals. So, adding up the math, since BG had that lead with 12 minutes to play against CMU, they have been outscored 229-148 in 92 minutes of play. This is as bad a streak as we have seen in BG basketball in a long time. From as far as I can tell, the last time we lost back-to-back MAC games by 20 or more was 2006, the second-to-last Dakich year. BG ended the year losing by 37 to OU and then 25 to Toledo. (That was rough, I had forgotten about it. BG ended the year with 8 straight losses, with margins of 8, 15, 19, 16, 14, 14, 37 and 25). Anyway, BG has now met that with back to back 25 point losses. Going back to 2002, I can't find another time where we allowed 100 points in a regulation MAC game. It may have never happened. UT is a good team, no doubt. In fact, our preview indicated that they are a really good shooting team that was set to be a tough matchup for us. The problem with this is that as good as they have been up to know, this is the best they have been all season. It was the best offensive game, 1.44 points per possession. Next best was 1.31. Their EFG was 74%, next best was 71%. They shot 76% on their 2FGs and 44% on their 3FGs. So they're good, but they were their best against us. The UT offense completely shredded the BG defense. Yes, they made some tough shots. But they made a lot more open ones. When they didn't need a 3, they often ended up with a layup after a little ball movement. BG had no one who could guard Fletcher. He scored 26 points on 12 of 15 shooting, plus 12 rebounds and 8 assists. It was a complete disaster. Wiggins played only 13 minutes and Coach made reference in the post-game interview to "needing to play defense." UT is better than us. You should never lose games like this in the conference. And you should never have your arch-rival having their best game of the season against you. 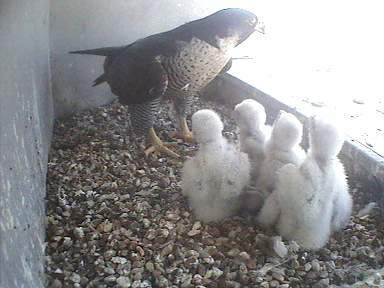 The Falcons are reeling in a way we have not seen in a long time. Yes, the team is young. But, you'd like to get better as the season goes along, and the opposite appears to be happening. This has got to get turned around, because right now this is beginning to feel like another lost chapter in the book of BG's MBB program. BG heads into Savage Arena under probably the worst possible scenario possible. On one hand you have BG entering having been embarrassed by below average teams over the last 52 minutes, while UT has won 6 straight after losing to Buffalo to open MAC play...Buffalo being the clear #1 in the MAC to date. This is going to be a tough one. As mentioned in the preview of the NIU game, you didn't know whether the NIU collapse was going to bring a resilient rally or a collapse in confidence. Having seen the latter, you have to think its going to be tough to get by this one. On the other hand, this is why we love sports. Because you never know. But we're at the "you never know" or "throw out the record book" stage of this conversation. 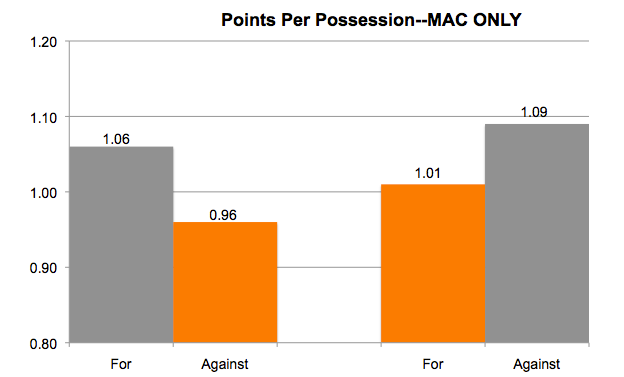 UT is the top offensive team in the MAC, with 1.19 points per possession in conference play. This is an amazing number. They are just scoring hot. Meanwhile, they are 5th in defense in the MAC. That's a pretty good combo. Meanwhile BG is #10 in offense and #4 in defense, rapidly falling after the NIU game. 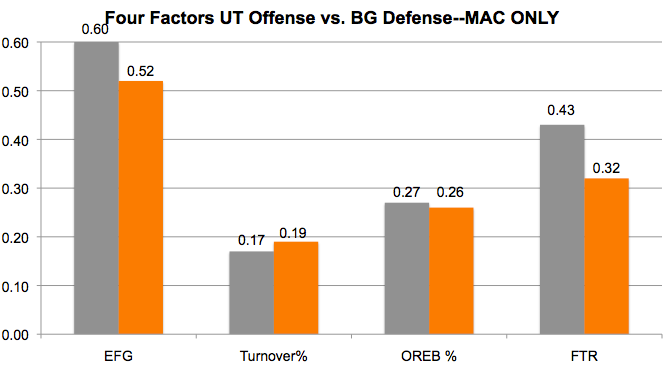 Simply put, if BG doesn't win the battles on the defensive end, they have no chance of outscoring the Rockets. So what makes UT so strong on offense? It is a deadly combination. They are just really good shooters. They are #1 in the MAC and #22 in the country in EFG. 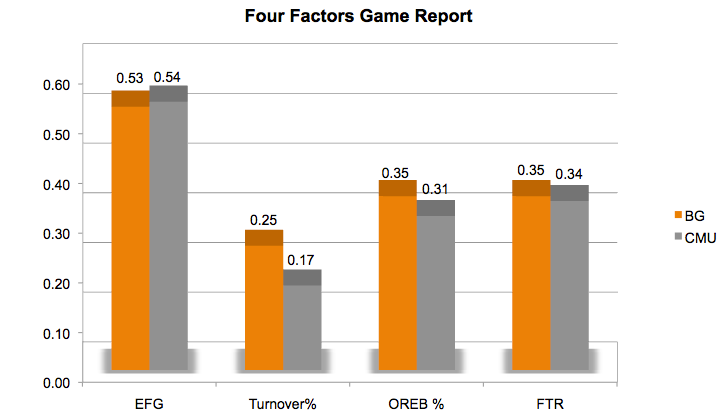 44% of their FGA are from 3FG and they make a ridiculous 46% from 3FG in MAC play. That #22 in the country and #1 in the MAC. They make roughly the same percentage from 3FG that BG makes from 2FG. They combine that shooting with being #3 at taking care of the ball and #2 in getting to the line. They are #10 in offensive rebound %, but they don't miss that often anyway. On the flip side, things are more evenly matched. BG is #10 in shooting and #10 in turning the ball over--both bad results. BG will need to get some made shots from its struggling shooters and then get to the line and make FTs at a high rate to stay competitive in this game. Individually, the Rockets are led by Tre-Shaun Fletcher, the Colorado transfer playing his only season for UT. In MAC play he's scoring 20 PPG on 50% and 45% shooting, which will get it done in any league, plus 7.4 RPG and 4.4 APG. Those are Player of the Year numbers. Jaelan Sanford is scoring 18 PPG on 48% and 46% shooting, also incredibly efficient for a big scorer. They have Navigato, Knapke and Marreon Jackson, all scoring 9 PPG. Knapke contributes 5.9 RPG. So, this one has a horrible set up for BG. The Falcons will have to show some serious resilience to get this one done. Not that it couldn't happen, but I fear these are the wrong teams playing at the wrong part of the year. Source: BGSU Football is hiring Jimmy Williams as their new defensive line coach. Was on PJ Fleck’s staff at Western Michigan. Was the #15 overall pick in the 1982 NFL draft after playing at Nebraska. He’s also coached at Toledo, EMU, Buffalo, UAB, among others. Jordan Strack is reporting that BG has hired a new coach. What is interesting is that he does not fill one of the two slots that were thought to be open. As you know, the d-line coach is Marcus White, who Strack reports in a separate tweet is moving to be the RB coach. As far as I can tell, BG didn't have a specific RB coach last year, so this is probably the tenth assistant. So, the interesting thing about Williams is that he knows Pellini from Nebraska, so this is his first opportunity to put a stamp on the program with a stronger base of assistants. Has coached quite a bit, including at Elite WMU, but also elsewhere in the MAC. Knowing the area and the conference is something else that I think has been lacking. Again, the Downard and Mickens spots remain open. Stay tuned. Over the last 52 minutes of play, BG's men have been beaten by a score of 128-73. That's more than 1 point per minute over a span that long. It is as poorly as I can recall us playing in quite a while. And then you consider that these 52 minutes weren't against Ohio State and Michigan or even Buffalo and Toledo, but against Central Michigan and NIU, neither of which has a winning record in MAC play. You should never lose like this within the conference, to anyone, but there you have it. The game sent shockwaves through the Falcon Nation. For most of the year, we've been hoping we were seeing the team that would start to turn the program around. Maybe not this year--we are young--but soon. I think fans had or have patience for Huger--one of our own, with a strong apprenticeship as an assistant coach. Just a little doubt is creeping into that equation. Here's the thing. You have a young team, that's fine. We have talent, but we're young. Much like the football team, you'd just expect to be young and get better, not have your worst games 20 games into the year. And you just start to wonder if this is actually going to turn around at all. For the second straight game, Coach Huger said that some form of over-confidence was the reason for his team's poor play. At CMU it was the big lead; with NIU it was the fact BG had just beaten them two weeks ago. Either way, this is an explanation that is hard to listen to. First, it would ascribe a level of delusion to this team that would normally require medication. Second, even if it is true, it is as much on the coaches as on the players. Coaches are supposed to have players ready to play and this team hasn't been--in a big way--for two straight games. Of course, when you hear that, you think that maybe there's some else going on...something in the scheme or the training or the execution that is lacking. I haven't lost complete faith in the program. I still feel like it can be turned around. But, you can't deny that doubt has begun to creep in. You were willing to give Huger the issues with the team in the post-Jans years. But you wonder if any progress has been made. UT is next up and that promises to be a very tough assignment. BG comes home to OU and Kent after that. Those should be winnable games at home. Obviously, you don't beat anyone playing this way, but it would be nice for the team to show some improvement and get a couple wins. The fear is that you end up in a slide that your young team can't break out of. #BGSU football: James Harris, who signed w/ #BGFalcons in December, has enrolled in school. He’ll take part in spring practice. Harris is a CB from Florida. So here's some news from John Wagner. James Harris, who signed in December, is now enrolled and eligible for spring practice. Harris is a CB, which is clearly a position we can use depth at. Here's what BG said when he signed. Played three years of varsity football at Blanche Ely High School under head coach Calvin Davis ... Also lettered in track & field … Team MVP as a senior … 2016 Second Team All-Broward County … Son of James Harris and Kathlyn Rigby ... Born July 14, 2000 ... Plans to study psychology. So, BG gets a quick rematch with NIU, who they beat only 2 weeks ago at the Stroh. So, not too much has changed since then, and here's the preview from that game. Since the BG game, NIU beat EMU in DeKalb and then lost @Buffalo and @Akron. They are 9-10 and 2-4, with only one home loss all season. As you can see, the game at the Stroh was offensively challenged. Shooting was pretty even and BG lost the turnover battle. However, the Falcons kept a very physical NIU team off the offensive boards. BG also made 80% of their FTS for a +6 advantage on its way to a 9-point win. In the first game, Wiggins led the way for BG with a 15-15 double double. Turner scored 14 and Frye 11, though they both had pretty poor shooting nights. On the NIU side, Eugene German, who was all-freshman with Dylan Frye, scored 19 and Gairges Daow had 7 rebounds. For this game, I don't think there's any mystery. BG will be hard pressed to do THAT well on the boards again and both teams shot more poorly than they are used to. NIU is also a very young team. BG is hard to figure out. I don't believe they will be able to get away with shooting 43% and turning the ball over 25% of the time. The formula for winning has typically been shooting decently, protecting the ball, getting to the line and playing decent defense. That's a little more sustainable. The other interesting issue will be to see if BG can bounce back from Saturday's disappointing collapse. Best case: they've been itching to get back onto the floor as soon as possible. Worst case is a loss of confidence that could take some time to resolve. Really nice event at halftime of the BG game against CMU. BG honored the 50th anniversary of BG's last NCAA tournament team and the last team to win the MAC Championship in its final form....as in regular season until the tournament started. A few things. First, it was awesome that so many of the guys came back after such a long time. Even I'm not old enough to remember this team, (although not by much). It was just great that they came back for the day. Second, I did not realize some of the long-term basketball success enjoyed by members of that team. Of course, BG fans are well familiar with the success of Bill Fitch, who coached the team in his only year at BG and went on to be one of the 10 winningest coaches in NBA history. (Also is top 10 in losses). His video tribute was really cool. He showed genuine enthusiasm and memories for his team and said he hoped to make it when BG gets another title. I did not realize Bob Hill was on that team. While not a great player at BG, he went on to win over 300 games as an NBA Coach. And then there's Rich Walker, a highly successful player at BG and then a college coach, most notably at Florida International. And then there's Al Hairston, who ended up as one of the most successful HS coaches in the state of Washington. There was All-American Walt Piatkowski who played in the ABA. 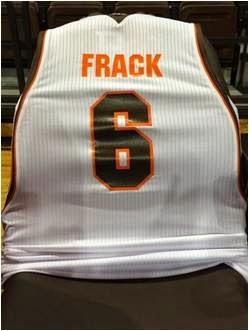 Anyway, really nice event by BGSU and I felt like the fans really responded to the team. As our old saying goes, Honor the Past, Create the Future. Those guys are champions forever and Falcons forever. Ryan Downard, BG's Safeties coach, has left the program to take a job with the Packers, according to John Wagner. He was actually working for the Browns before heading to BG in a Chief of Staff/DFO role (before becoming a position coach) and now is headed back to the NFL. This now creates three open defensive assistant positions. The 10th assistant has been promised to Pelini, and then Downard and Mickens both have departed since the year ended. Marcus White (D-line) and Matt Brock (LBs) are the only coaches remaining on defense. You survive a first half where Wiggins is in foul trouble and plays only 2 minutes. You come out hot in the second half. With 12 minutes left, you are up 15, 64-49. You've got to win that game. At home? You've got to win that game. Apparently, and this comes from Coach, BG decided that they had the game won and let the foot off the gas. As hard as that is to believe, especially given BG's track record of giving up leads, that's what he said happened. And CMU took advantage, outscoring BG 35-11....35-11!!!! !....over that 12-minute stretch and BG went from winning by 15 to losing by 9 in a little over a quarter of the game. You don't want to give up 35 points in 12 minutes and you don't want to score 11. Together, its an epic collapse that just cannot happen. I do think we have some pieces in place. I do like the future. However, for THIS year, this was a disaster. BG had a chance to go to 4-2 in the conference. Remember, BG has yet to play Buffalo or Toledo...or WMU or Ball State...this was a win you really needed. Not that CMU is bad, but they are certainly near our level and we had them down by 15. 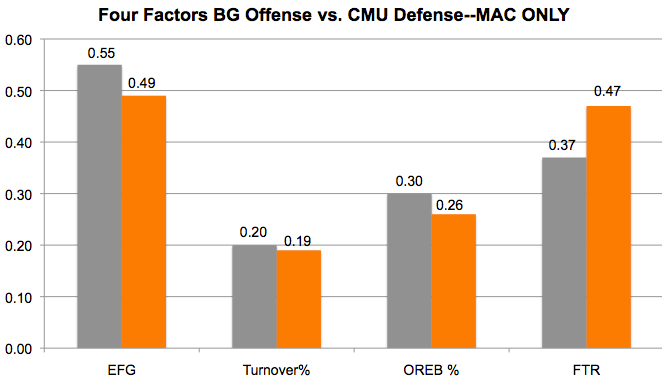 CMU had 1.16 points per possession, whcih is the best against BG in the MAC season. BG scored 1.03 points per possession. When you look at how the stats broke out, it was actually pretty even on 3 of the 4 measures. 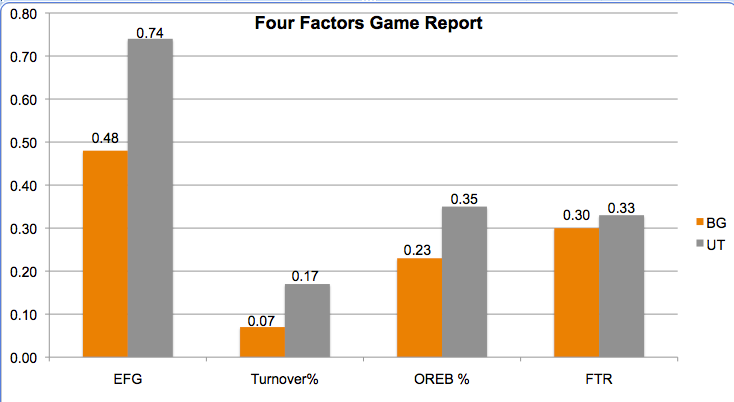 The worse was turnover%. BG spent most of the year taking really good care of the ball. 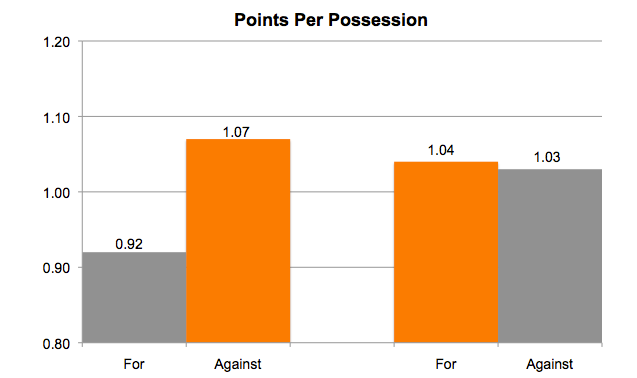 Now, they have been at 25% of possessions in 3 of the past 4 games. The average for MAC games is 19% so far. Some of the turnovers were caused by the CMU pressure and some weren't. Some were inexperience based...BG had one possession with Plowden and Cummings trying to break it with predictable results. If you look at the stats, Frye had 5, Wiggins 3, Caldwell 3, Lillard 2 and Plowden 2, and other guys with 1. One thing that isn't measured is whether they were "live ball" turnovers or dead ball turnovers. There seems to be an idea evolving that the live ball turnovers, which often result in run outs, are worse. CMU had 10 steals, which is guanteed to be a live-ball TO. CMU shot 21 FTs and BG shot 17. CMU made 17 (81%) and BG made 13 (a very solid 77%) but CMU ended up +4 at the line. All 5 BG starters ended up in double figures. Caldwell led the team with 6 of 11 and 3 of 7 shooting, with the 3 treys coming in quick succession as BG drove to the lead in the early 2nd half. He had 4 assists and 3 turnovers. Wiggins had 13 on 5 of 7 shooting to go with 11 rebounds in 18 minutes. That's pretty good. Frye had 13 on 5 of 13 and 3 of 10 shooting to go with the aforementioned turnovers...that's a less efficient day. Turner had 12 on 5 of 9 and 2 of 4 shooting and 5 rebounds. Derek Koch had 11 points on 4 of 9 shooting and 5 rebounds in 25 minutes. So, BG plays @NIU on Tuesday. BG beat the Huskies at the Stroh and have a tough week, heading to Savage to play the Rockets on Saturday. Things get a little tougher, which is why losing this one will sting so much. We are a young team, I get it. Hopefully, this is part of "The Process." So next up is CMU coming into BG. This is a good opportunity for BG to show some strong play at home after the Miami win. As I have mentioned, BG's early part of the MAC schedule has turned out to be a little soft, so there's every need to make hay on these games, especially at home. CMU is 12-6, but they played an extremely soft schedule in the non-conference, ranked #339. Their best win was Sam Houston State, #202 in the country. Meanwhile, they are 1-4 in the MAC, and a four-game losing streak. They opened with a win over Ohio in Mt. Pleasant, and then they lost @Kent, @EMU, Toledo and @Ball State. As you will note, those four losses include 3 road games and two of the top teams in the MAC in Toledo and Ball State. They lost their last 8 MAC games last year, so that's 12 out of 13 for the run. CMU beat BG 82-76 last year in Mt. Pleasant. They got 55 combined points from Rayson and Keene, both of whom are no longer with the Chips. (Keene, the nation's leading scorer, left early and is playing pro ball in Italy). So, we're looking at MAC only stats from here on in. Much cleaner way to look at everything. The MAC is the competition we are supposed to be able to beat. We had plenty of issues with defense in the pre-season, but let's not lose sight of this: BG is the top-ranked defense in the MAC, based on points per possession. Meanwhile, CMU is the #4 offensive team, so that's going to be interesting. The flip side is interesting for the opposite reason....BG is 9th in offense and CMU is 11th in defense. When you see spreads like this, you normally have a good game. So let's see how that battle will shape up. The interesting part is on the boards. BG is #1 on the defensive boards and CMU is #1 on the offensive boards. That's going to be the key. The other elements look pretty evenly matched. Flipping around, remember, here is where both teams struggle. CMU is the second easiest team to shoot against in the MAC. BG is 7th in shooting. CMU is weak on the boards, as is BG. The key difference is something I talked about after the Miami game. 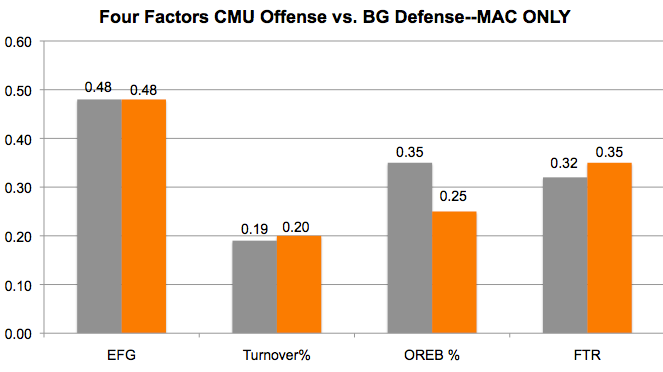 BG is #1 in the MAC in getting to the line and CMU actually gives up a lot of FTs, 3rd worst in the MAC. If BG gets to the line and makes the shots, they are tough to beat. Their leading scorer in MAC play is Shawn Roundtree, at a really shaky 14.4 PPG on 32% and 31% shooting. That's very inefficient. Their 2nd-leading scorer is Cecil Williams, a JUCO player who is 6'6". He's scoring 14 PPG on 48% shooting. He's also getting 6.4 RPG. 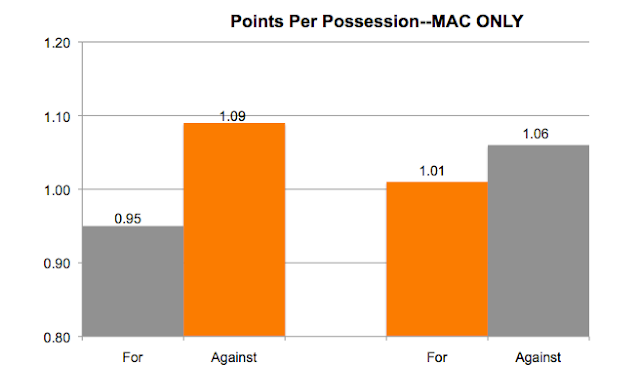 Their other double-figure scorer in MAC is David DiLeo, their leading returning player from last year. He's scoring 11.4 PPG on a rough 36% and 32% shooting. 6'11" Luke Meyer and 6'5" G Kevin McKay both average 6.4 RPG. McKay adds 3 assists per game. CMU is going to come in hungry for a win. I'm really looking forward to seeing how this one plays out. So, these are the words of Hassan Belton, who says he is coming to BG after being committed to UTEP. He was playing at Butler Community College in Kansas. He's a 6'0 and 210 lb LB. It's a bit of a story. He is from South Carolina, where he was all-state twice. He was a 2-star recruit on 247, 3-star with Rivals. He then went to Western Carolina, where he played for one season, making 11 tackles. Then, for the 2016 season he transferred as a walk-on to South Carolina, where he sat out under NCAA transfer rules. So, for 2017 he went to Butler Community College, which is in Kansas. This is a highly ranked program. Belton had a very productive season. He made 67 tackles, with 3.5 sacks and 14.5 TFL, 2 forced fumbles, 2 recovered fumbles, a pick and 5 pass break ups. Clearly, he comes at a position of need, where BG already has one JUCO LB who is a January enrollee. In his tweet, Belton says he is enrolling in January as well, although the semester started 10 days ago. Welcome to the Falcons, Hassan. Last night in Oxford, BG came up with the kind of win we have been waiting to see for a while. Yes, I know, it was not against one of the top teams in our league, but I think we needed to see BG just go out and beat somebody in the MAC, anybody, and doing it on the road was huge. The game was competitive throughout. BG was up early, then Miami went up and they led by 2 at the half. The game was tied in the first minute of the second half, and it was game on. The next 8 minutes were very tightly contested. With 12 minutes left, BG was up 50-49. And from there, the Falcons did what you see winning teams do, which is take control down the stretch, outscoring the RedHawks 31-21 over that period, scoring and getting stops and rebounds, and then making FTs down the stretch to get the win. The scoring came on two runs. BG went on a 7-0 to pop the lead to 8 with 9 minutes left and then after Miami cut the lead to 4 the Falcons went on an 11-1 run to put the game away. At that point, they led by 14 with 4 minutes left. The Falcons won 81-70. What this constituted was a game where BG put a complete effort together on both ends of the floor. BG scored 1.12 points per possession, their best game of the MAC season and they held Miami to .96 points per possession. 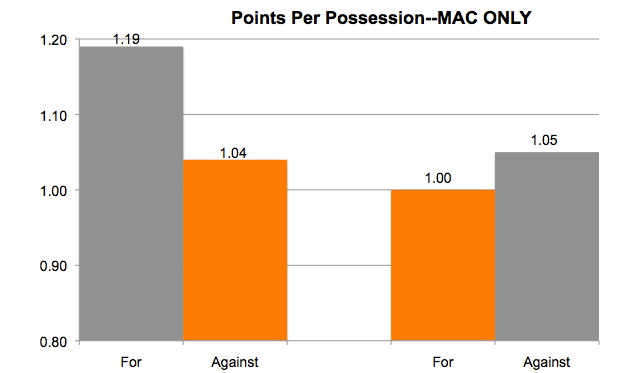 It was the first MAC game this year when BG was on the "right" side of 1 point per possession offensively and defensively. BG excelled most at propelling the ball through the rim. BG shot 60% overall and 46% from 3FG. The 67% EFG% is their best this year against D1 competition. Meanwhile, Miami shot 40% and 29%. The shooting helped BG overcome a poor game with turnovers and offensive rebounding. Unlike the first game, BG had a great game at the line. BG made 21 out of 26 for a +5 FT margin. Making FTs is vital for BG because of the way we play. The Falcons are #38 in the country in the rate at which they get to the line. The idea is to attack the rim and get to the line. They simply have to make FTs. BG gets 23.6% of its points at the FT line, which is #16 in the country. The Falcons currently shoot 73% which is #112 in the country. 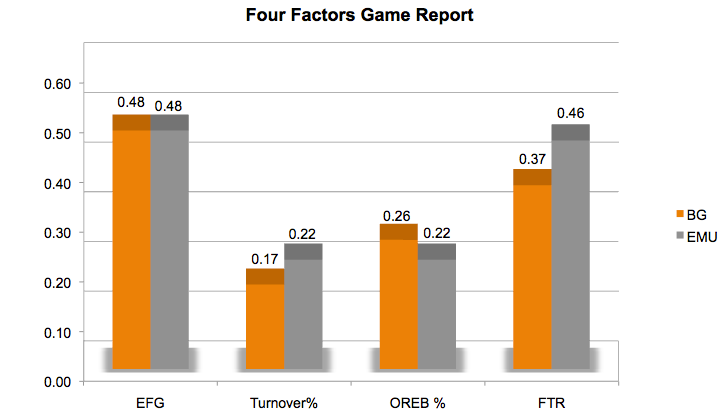 The national average is 70% and given the style of play, BG just needs to be there or better to win. Let me say this. Demajeo Wiggins is playing really well. It would be very tough to play much better than he did, in fact. He scored 22 points on 8 of 9 FG shooting and 6 of 7 at the line, added 15 rebounds and 5 assists when he was double-teamed. He did play 36 minutes, which helps those bulk numbers, but I don't care what that says, he was a dominant force in that game. It's not going to get easier--he's going to get more and more attention--and that's where it will be a team game. When A'uston Calhoun was surrounded in the post, we could never find anyone to make the shots. Hopefully, we have those guys. Oh and he ends up at the line, too. Rod Caldwell had a bounce-back game with his shooting. He had 12 points on 4 of 6 shooting to go with 4 assists over 1 turnover. He's solid. He needs to find that balance between forcing offensive opportunities and disappearing. This was a good example of that balance, in my view. Dylan Frye, playing hobbled, had 16 on 5 of 12 shooting and 2 of 5 from deep. It was also a bit of a bounce-back for him, as he has been struggling with his shot. Daeqwon Plowden had 10 points in 11 minutes, shooting 4 of 4 from the field and making both his 3s. CMU comes to town on Saturday. The next step is for BG to become tough to beat at home. It would be great to put another strong effort together and move to 4-2 in the MAC. BG's early schedule is way softer than the later schedule---Buffalo, Ball State and Toledo wait for us--and it's good to rack up some wins. Saturday would be another great one to get. So, BG now moves to Oxford to take on the Miami RedHawks. We just previewed the game a couple weeks ago, so I doubt if much has changed. Since the BG game, they beat Kent at home, and lost to WMU in Oxford and at the Buffalo chainsaw. They are 2-2 in the MAC. They beat BG in the first game 77-72 at the Stroh. You can see below what went on. Basically, there were two key factors in the game. First, BG made only 11 of 21 FTs, something that it is apparently clear is something we cannot win with. Second, BG was completely unable to contain Darrian Ringo with dribble penetration. He's a JUCO player who is making an immediate impact. He's averaging 8 assists per game in MAC play, which is the MAC leader by more than 2 assists per game. For the year, he's #2 nationally by assisting on 53% of the baskets his team scored while he was on the floor, behind only a guy named Trae Young. No one else is over 45%. He had 7 turnovers in the BG game, but has only had 11 in the next 3 games to go with 25 assists. The last issue was a young man named Dalonte Brown, a true FR from Bowsher HS who had 16 points and 17 rebounds in the first game. He hasn't been in double figures in scoring since, so hopefully he'll be back down to earth by the time this game happens. BG is 2-2, with both losses being games they could have won. (In fairness, the EMU game went into OT, so that could have gone the other way as well. With @Miami and CMU this week, BG can stay at it and maybe pick up a couple of wins. It is certainly possible. So, in basketball there are hundreds of individual plays. This game had 73 possessions, which means a total of 146 times down the floor. Each of them contributes to the outcome. But in the Akron game Saturday, one action, one moment was decisive. Akron had the ball with a tie game and less than a minute to play. They had to shoot by about :19, so BG can expect to get the ball back. Even if they score, you can get the ball back. What BG really needs is a stop, though. That way, you get the last shot and worse case is you get overtime against a team that had fouled 3 players out. BG got 90% of the way there. Ivey missed a 3 with :22 left. If BG clears the board, you have exactly what you need. Except, Akron gets the board and resets and now they are holding for the last shot. Which they hit, despite forcing the Akron player to go up in a crowd. That happened with about 3 seconds left. Akron fouled BG to prevent a 3 getting off and won 80-78. (It was pretty funny listening to Reghi and his broadcast partner talk about what Akron's defensive strategy might be without once broaching the idea that Akron would foul, which is the obvious call. That was right after several mentions of true freshman Justin Turner. Anyway). Coach was clearly frustrated in the post-game. Between the lost offensive rebound and missed FTs, BG could and probably should have won this game, despite not having the lead for the last 37 minutes of the game. BG is on a streak of four out of 5 on the road and picking this one off would have been a great way to start that run. BG trailed by 14 with 7 minutes left, a point where you'd have to think that winning didn't look very likely at all. Prior to that, BG just hadn't been able to string any stops together and make a run. This time they did. BG scored 12 straight points and had the lead to 2 with 4 minutes left. With 2 minutes left it was tied. And with :49 left it was tied, leading into the finish described above. 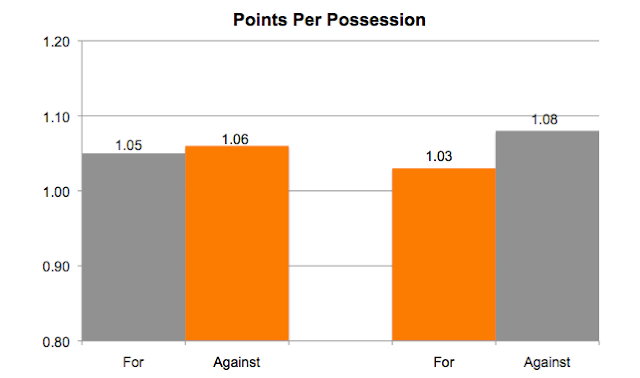 Akron ended up at 1.09 points per possession and BG ended up at 1.06 points per possession. It was a 73 possession game, which is a pace BG typically plays at. A couple key elements here. First, BG is shooting awfully. Their EFG has been under 48% in every MAC game. BG made 38% of its 2FGs for the second straight game, which is just awful. What salvaged it was that BG made 44% of its 3FGs, did a great job protecting the ball, an average job on the offensive boards and a ridiculous job getting to the line. BG's offensive plan is pretty clear. Attack the rim and get fouled. It worked. Akron committed 31 fouls in a game they led almost the whole way. BG shot 43 FTs. 43! Are you kidding me? Unfortunately, BG only made 29 FTs. That's about 67% and BG usually shoots 72%. At their normal rate, that would be 31 FTs and probably a win. Even as it was, BG was +13 on FTs. Justin Turner had 30 points for BG. He shot 8 of 15 overall, made all 4 of his 3s and 10 out of his 12 FTs. Also 5 rebounds and 3 steals. Wiggins had a good game as well, scoring 18 and grabbing 12 rebounds. Shooting wasn't great at 4 out of 9, but he made 10 out of 14 FTs. Dylan Frye had 14 on 5 of 14 and 3 of 7 shooting. Not to get too far into it, but other guys are really having a hard time right now. Anyway, with all that, BG should have won this game. Akron is not what they normally are, but it would have been a good one to get. BG now goes to Oxford to take on Miami, a team they lost to at home but also could have beaten. Miami seems to be a little better than expected so the rematch shiould be interesting. So, it is back to the JAR for the Falcons, a long and storied den of horrors for our team, that has won only once in recent memory and that was 2009. It is no secret that Akron absolutely owned the Falcons...until last year when BG finally took down the Zips on the way to splitting the season series. Things have changed. Keith Dambrot has moved along to another school and most of this team left in the meantime. Akron brought in successful MAC Coach John Groce to take his place, and there's every reason to think he will succeed. For this year, however, there is an adjustment period. They are 7-8 with one non-D1 win and they have lost 6 out of their last 7 games. They are an unheard of 0-3 in MAC play...something which makes me feel a little nervous. They lost @WMU and @UT, and then by 22 to UB in the JAR. (UB is the clear class of the MAC to date). I was watching when they led USC at halftime and then went on to lose by 31 points. So, how does that happen? Well, they're average. They are decent shooters but not great. They turn the ball over too much, and OK on the offensive and at giving up FTs. In the NIU game, BG held an average-ish team to a season-low offensive performance, so that's what we will be watching for here, too. One thing hasn't changed. The Zips shoot a lot of 3s (#33) in the country. And they make a high percentage (#90). Here is what is interesting. After being a good shooting team in the early year, BG has really fallen. Their overall EFG% is 293rd in the nation (out of 351) and dead last in the MAC in MAC play. Meanwhile, Akron is 300th in EFG%. So, we have two polar opposites and not in a good way. Beyond that, things are pretty evenly matched. The Zips don't cause many turnovers, they do a really good job on the offensive boards and they keep teams off the line. (This is also a potential key. BG has been getting consistent advantage at the FT line). Daniel Utomi is their leading scorer. He's a sophomore scoring 18 PPG on 46% shooting, to go with 44% on 3FG and 80% at the line. He also gets 6.6 RPG. He's 6'6" and one of the best players in the MAC you've never heard of. Their next scorer is Malcolm Duvivier, a 6'2 G who is a graduate transfer from Oregon State. He is scoring 14.6 PPG on 41% shooting from 2FG and also from 3FG. He averages just under 4 assists per game but also 3 turnovers per game. Jimond Ivey might be the most recognizable name on the team. He's scoring a rough 12.6 on 40% and 33% shooting. The 6'5" JR also averages 5.6 RPG. When I watched the USC game, it was just very disorienting. Akron was just so consistent and you'd get to know these guys like they were own team...and all of a sudden, these other guys are running around. As usual, they are tough at the JAR, with the Buffalo loss being their first home loss of the season...but also by far the best team they have played at home. I talk a lot about BG being the 15th youngest team in the country. Akron is the 27th youngest team. Should be interesting. Even as Akron struggles, this would be a huge win for BG to get on the road. The Zips are on a skid, though, and they'll be very hungry to get a W.
Update: The Akron starting C had open heart surgery and is expected to miss the remainder of the year. So, running a little late here, but BG put together a winning effort on Tuesday to beat NIU and move to 2-1 in the MAC, holding serve at home. For much of the game BG played really well. Obviously, you'd like to blow out to that big lead and hold it the whole way home and win by 10, but I just don't think our guys are there yet. We'll take a winning effort anytime. I mean, BG led the game for 34 consecutive minutes. They led by 14 with 9 minutes left when things began to get a little loose, as NIU scored 13 straight points to chop the lead to 1 with 6 minutes left. That's a fast way to lose a lead of that size. Now, to BG's credit--and in contrast to some of our teams from the past--BG stopped the run and made the scores and stops they needed to win the game. Other BG teams might have just folded up and lacked the ability to respond as needed. In the possession just after the lead was cut to 1, Matt Fox drained a 3 to put it back up to 4. When NIU got it to 2, Justin Turner nailed a 3 to put it back to 5. In all, in the six minutes left after NIU got the lead to 1, BG outscored them 14-6. That's what you have to do to win conference games. That's only 2 FGs for NIU in those last six minutes. Final score, 66-57. Now here's the thing. BG has let some very poor offensive teams run wild on them. In this one, NIU came in averaging 1.05 per possession and BG held them .78 points per possession. That's the best defensive performance for BG this year against any team not named for a place where you can take the cure. As you can see below, BG did an excellent job defending the shot, did a fantastic job on the defensive boards against a normally very physical NIU team, and held the Huskies to 14 FT attempts, of which they made 10. It was no work of art for BG on offense. BG had .9 points per possession, which is their fifth straight D1 game under 1. BG shot poorly and had a terrible game for turnovers. They did a great job on the boards, however, and got to the line 20 times, making 16, which is a significant improvement over the Miami game and maybe the biggest difference. Individually, the big story was Wiggins. He went 15 and 15 on 5 of 11 shooting and five of 8 at the line, including his last 3 in crunch time. He did have 5 turnovers, some of which were not directly on him. NIU was packing it in on him and I think we forced and telegraphed the ball in their a few times. Justin Turner had a tough 14 on 4 of 14 shooting and 5 rebounds. Frye had an even rougher 11 on 3 of 8 shooting, including a couple of air balls. Koch added 7 points and 7 rebounds in 20 minutes. Antwon Lillard continues to be a contributor since his suspension. He had 8 points and 6 rebounds in 21 minutes to go with 4 assists and 2 of 4 shooting. The team just seems more effective when he is the game. He gives them another ball handler and someone of size who can create opportunities. Matt Fox had 8 points in 16 minutes on 3 of 6 shooting. BG played very small again. As noted, Koch only played 20 minutes and Plowden played 8 and Uju and Gadsen did not play at all. Next up is Akron at the JAR, a building of many horrors which can possibly be exorcised since Keith Dambrot has departed. So John Wagner has the goods on the football team as Spring classes started back up at BG today. You should head over and check the story out and then come back here and I will have some comments. First, for all the drama right as the season ended, BG did not end up (at least yet) with a lot of transfers or players leaving the program, even after the 2-10 season. That's to the credit of our Coaching staff, who have done a good job at recruiting and retaining players. Second, four players are in early. Bryce Veasley is notable. With Morgan and Cunningham leaving the program, there is no clear all-down backup, and you have to guess that by opening day Veasley will be #2 on the depth chart, with a hope they can redshirt him. There's a kicker in town, which is good because Suder is a Sr. No idea of Nate Needham is the answer, but he's in early as a JUCO transfer. Also, the new punter and a JUCO LB are in, both guys who you would think will contribute this year. Beyond that, if there are any other guys who left, I have not heard about them. So, the beat goes on. Next up, on the short turn around, are the NIU Huskies into the Stroh on Tuesday. They are 8-7, with the second-lowest kenpom ranking in the MAC, but then again the lowest is Miami and they beat BG at the Stroh. The 8-7 includes 2 non-D1 wins. In a common opponent, they beat Green Bay by 20 in DeKalb. They are 1-1 in the MAC, with a home win over Kent (by 14) and a road loss to OU (by 10). (Of the 12 MAC games so far, only 2 have been decided inside of 4 points or in OT). Mark Montgomery, their coach, is in his 7th season, and has had only one winning record. On the other hand, he was 10-51 in his first two years and the Huskies are now at least a .500 team, though picked to be near the bottom of the MAC. They were bitten by the graduate transfer bug when Marin Maric left for DePaul, where he is scoring 14 PPG and getting about 6 boards. (He was expected to leave early, but supposedly to go home to play in Croatia). Anyway, they are a young team this year, though not as young as BG. This game is pretty evenly matched. NIU isn't terrible at anything and yet they don't have any real strong points either. Let's look. As you can see, they are an average offensive team and BG is just slightly below average after a couple of improved performances recently. On the other hand, BG is now a below average offensive team and NIU is a considerably below average defensive team. So, you just don't see teams matched like this. NIU is basically right on the national averages all the way across that line and BG is right there with them. One thing. NIU is 2FG-focused. Only 15 teams in D1 basketball take fewer 3FGs. 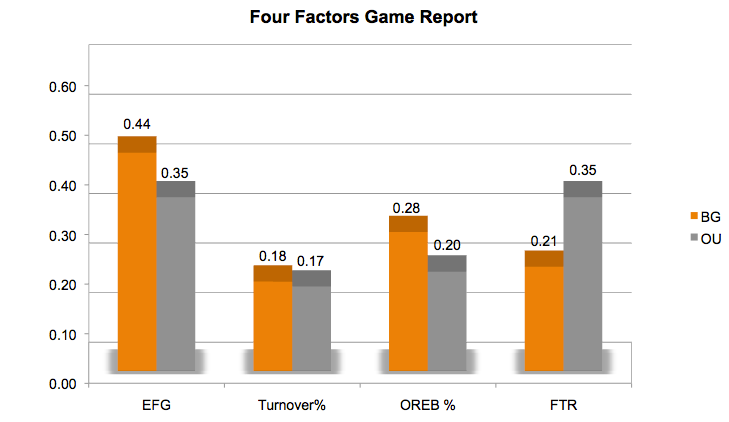 They are average at 35% when they do shoot a 3, and poor (48.5%) on 2FGs, given them an Orrian kind of profile. They make 72% of their FTs and prefer a slower pace. Things are a little more interesting on defense. NIU is easy to shoot against, and that extends to 2FGs and 3FGs. They do force some turnovers, They are OK on the offensive boards and they do a good job keeping teams off the line. 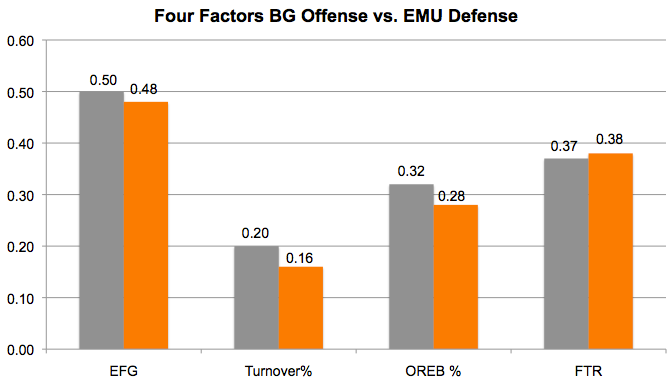 BG has been struggling to shoot--even in the EMU game--and this is an opportunity to make life easier by making shots again. Their leading player is Eugene German, who was all-Freshmen last year. He scores 19.5 PPG on pretty good 46% shooting, those he is a frequent and poor 3FG shooter (32%). Junior Levi Bradley is their second-leading scorer. He is 6'7" and scores 14.6 PPG but only shoots 43%, and gets about 6.3 RPG. JUCO transfer Dante Thorpe is scoring 12.7 PPG and is very efficient, shooting 61% and 50% from 3FG. From BG's standpoint, a key issue is the availability of Dylan Frye. Beyond that, this is a game that BG needs to get on home floor. So, with 4 minutes left in the first half, things could not have been going worse for the BG Falcons. They were down 24-13...that's right, 13 points in 16 minutes of college basketball. The EMU zone had BG in fits and while EMU wasn't exactly lighting the scoreboard up on the other end, they were getting open looks and droppings 3s. Meanwhile, BG was having foul trouble with their bigs. So, Coach Huger said they went small out of necessity. And playing with a four-guard lineup, BG finally broke out. They closed the half with 16 points in the remaining 4 minutes and help EMU to 6, heading into the locker room down 1. EMU came out of the locker room and jacked it back up to 6 points, but BG had another rally and with 5 minutes gone in the 2nd half the game was tied. From there it was a dogfight, with no team leading by more than 4 points. Minnie tied the game inside of 1 minute with a FT and then both teams traded pitiful last-minute possessions before overtime. I did not know this, but Coach Huger has never lost in OT at BG. He wasn't even behind in this one, as Matt Fox opened the scoring with a 3. There wasn't a ton of scoring, and then with 90 seconds left Lillard score a hoop to put BG up 3 and then BG made 4 of 6 free throws in the last minute to close out the 75-71 overtime win. It was an important win. Not to make EMU out like the best team in the MAC, but after losing to Miami BG needed to get back on track before they dug a hole that would be very difficult to get out of. Through the first 16 minutes they literally could not have been playing worse, but they got it together and ground it out and ended up with a win they kind of needed, not to make the 2nd game of the season too dramatic or anything. As mentioned, they did it with a four-guard lineup that did not include Dylan Frye, who is injured but apparently not seriously. But Antwon Lillard had a huge game and Matt Fox was nailing shots left and right and Justin Turner had his turns and BG got the win and for most of the first half, that had seemed like the most unlikely thing possible. It certainly wasn't an offensive slugfest. BG had .98 points per possession and held EMU to point .93. Neither is very good, but BG made enough shots to get the win. These are the stats of a pretty close game. The teams were equal in shooting and no one did much on the offensive boards, a victory for BG since EMU relies on that and we were playing a small lineup. BG got a couple of extra possessions due to turnovers and EMU was +3 on FTs for the game. BG had 2 double-doubles. Lillard had 20 points on 8 of 12 shooting and 12 rebounds and 5 assists and 2 turnovers. Wiggins scored 15 points on 6 of 13 shooting and added 11 rebounds....and held James Thompson to one offensive rebound. Matt Fox had 18 on 6 of 10 shooting from 3, and Turner had 15 on 4 of 8 shooting. While he had a rough night shooting, Rodrick Caldwell had 6 assists and 0 turnovers. When it is said BG went small, they went small. Wiggins played 36 minutes, but Koch played 10, Uju 5 and Gadson 3. That's a small lineup. BG has a decent shot now to make it 2 in a row, with NIU coming to town, probably the next most likely team for BG to beat this year....at least on paper. BG will head north Saturday to take on the EMU Eagles. This is always a hard team to figure early in the year, because they play an incredibly weak pre-season schedule. This year, it included 4 non D1 games. Rob Murphy is in his 7th year in Ypsi and while there was some minor success early on, they have had a .500 or less record in MAC play the last three years. To that point, their reputation is playing super-tough defense out of a 2-3 Syracuse zone. Early in the Murphy regime they did play great defense, but the last three years they have been pretty much average in the MAC. They are 9-5 overall and 5-5 in D1 games. Their best win has been at home against Oakland, and their losses include @Syracuse, @Indiana and @Ball State. In fact, they also lost @Oakland. They destroyed BG at the Stroh last year, by 28. The year before BG won in Ypsi. EMU is undefeated at home this year. So, here you have the season averages for both teams. As noted after the Miami game, BG's offense has been struggling over the past few games, so this may or may not be representative of what will be seen on Saturday. Anyway, based on this BG and EMU are pretty evenly matched. On the other hand, if BG's opponents continue to overshoot their season average against the Falcons, EMU will have an easy day. BG did play USC-Upstate earlier this year and they play a similar zone, which could help the Falcons. This is pretty much would you would expect to see. An EFG of 51% is slightly above the D1 average. The teams are pretty evenly matched down the line. EMU tends to rebound well on the offensive boards, and after the success Miami had on the boards this is something BG will need to buckle down on. Their focus is on getting the ball inside. They are 304th in the nation at taking 3s, and 260th at making them. 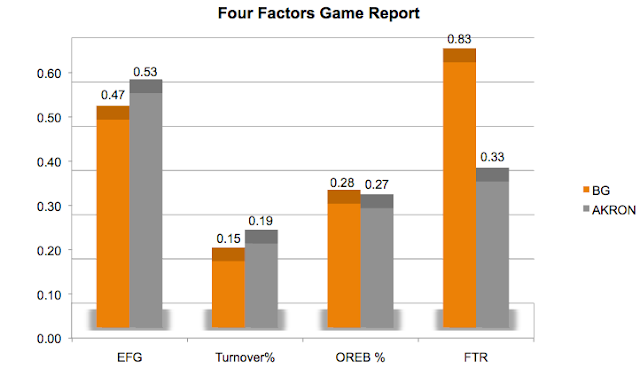 They are making 51% of their 2FGs, which is considerably better than the national average. They are not a great FT shooting team. So, when BG has the ball, there are some interesting points. As you can see, EMU is allowing about average FG shooting, but BG is slightly below with its shooting. BG does take good care of the ball, and EMU does force some turnovers, so BG will have to continue to excel there. Like most zone teams, EMU is not great on the defensive boards. Individually, we all know about James Thompson IV, the 6'10 post player who is a two-time All-MAC player and is only a junior. He continues to fill a stats line as well as anyone, averaging 16 PPG on 66% shooting and adding 11.5 RPG. They have added 6'9" F Elijah Minnie, who is a transfer from Robert Morris. He is scoring 17 PPG, shooting 45% overall. He's more a stretch 4, leads the team in 3FG attempts (makes only 33%) and adds 6.1 RPG. Their second leading scorer is Paul Jackson, a transfer from Eastern Kentucky. He's scoring an inefficient 16 PPG on 44% shooting, but does add 4.6 assists per game. BG's certainly the underdog in this one, but it isn't something that can't be done. It would be great to see the Falcons get back on serve with a road win. We remain a young team, but I think we are better than we played Tuesday. Bowling Green safety Marcus Milton was granted another year of eligibility. Huge for BG’s depth in 2018. NCAA had deemed him out of eligibility at the end of last season. This out yesterday from Thomas Schmeltz of the Sentinel. As noted, this is big for BG, which needs every body on the defensive side of the ball that they can find, especially one with some playing experience. Plus, he gets to do senior day twice. The MAC Season opened on Tuesday and BG had a game that it needed to win right away on the schedule. Not that Miami should have been easy to beat, but they are a team that is also very young, has struggled in the pre-season and it was a home game for BG. If you have any hopes of making a home berth for the tournament (a reasonable accomplishment for this year), you need this win and it is first on the schedule. And we did not get it. The RedHawks won 77-72. BG was the only home to lose on Tuesday in the MAC. Beyond that, Miami was the better team for most of the game. BG did jump out to a 7-0 lead, but the game was tied again with 11 left in the first half. Miami took the lead with 8 minutes left in the half and except for two possessions, led the entire remainder of the game. They led by 5 at the half and scored the first 8 points of the second half to go up 13. BG battled back to get it as close as 2 at one point and 3 a few others, but down the stretch BG went cold at the FT line and the RedHawks outran the Falcons to the finish line. So, here's the thing. BG is just woeful on defense. They just don't consistently guard anyone. Dribble penetration is a real problem. Miami's PG got to the paint at will and once BG's man defense breaks down, the ball eventually finds an open shooter. Miami had 1.037 points per possession, which is actually right on the national average, but they came into the game averaging only .92 points per possession, so once again a team found its shot against us. They shot well 53% overall, which is well above the national average, but turned the ball over a lot. They were much stronger on the offensive boards than BG was. It was their second-best D1 game of the season. Meanwhile, BG has hit an offensive slump. 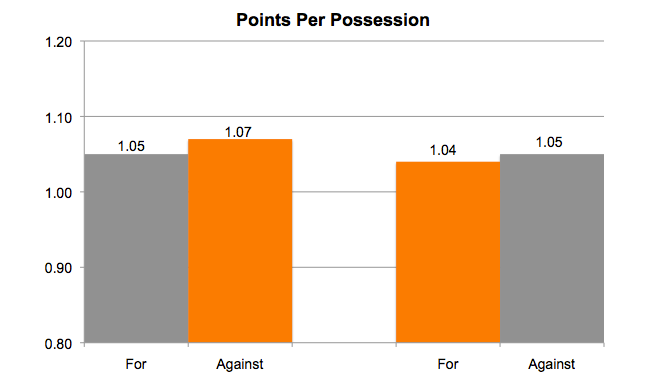 Since the Evansville game, BG has been under 1 point per possession in three straight D1 games. In this one, they hit .97, which isn't awful but isn't the formula BG used to win some games. BG hit 37% from 3FG, which is about national averge, but missed a ton of shots near the basket and shot only 42% on 2FGs. The other issue was FTs. BG gets to the line and has been one of the stronger teams in the MAC at the line to date. BG actually got to the line a little more than Miami, but was 11-21 while the RedHawks were 14 of 18. Demajeo Wiggins had the most points for BG, with 15 on 7 of 10 shooting plus 4 out of 5 at the line. He had only 5 rebounds and seemed to have a few mishaps defensively. Antwon Lillard had his best offensive game of the year, with 15 points on 6 of 11 shooting and 5 rebounds, but at one point was pulled over the floor due to defense. Daeqwon Plowden had 11 off the bench with 2 3FGs and one poster dunk. Justin Turner had a rough 10, on 4 of 15 shooting. Frye was scoreless and turned an ankle, Caldwell had 6 on 2 of 8 shooting and missed all three of his FTs (in addition to the issues guarding the Miami PG) along with 3 assists and 3 turnovers. BG plays three of the next four on the road. The home game is next Tuesday against NIU, the second most winnable game on paper for BG. MAC play is tough. No weaknesses hide very long. BG is capable of playing better than they did on Tuesday, and they need to find that way back. Next one is tough, at EMU and their 2-3 Syracuse zone. This is an interesting assignment for BG. Looking at the whole schedule right now, this is the one we would be most favored to win. So, that's good if you get off to a good start, but does kind of put some pressure on the first game, because you don't want to start with this one as a loss. Miami has a new coach. Their new coach is Jack Owen, who came over from Purdue. The program has not recovered since the Charlie Coles finish. This is unusual...Miami is a historic MAC power, so I'd expect that Owen will get them rebuilt. He was Matt Painter's top assistant for 9 years and he's a great match for Miami. In the meantime, though, it doesn't happen in one year. Also, you'll remember that the All-MAC Freshmen Michael Weathers transferred to Oklahoma State and his twin transferred to Duquesne. Both teams are very young. Miami is the #314 youngest team and BG is #341. Miami is 7-6 with 2 non D-1 wins. Their best win was over Fort Wayne in Oxford and they lost to Hartford on a neutral floor for their worst loss. They are ranked #274 as of 12/31. They have won twice on the road this year. So here's how the game shapes up overall. Tempo will be a big deal. BG is going at 75 possessions a game and Miami at 67. If BG can get stops then they can push the tempo. As we have seen before, BG is a team that struggles to get stops playing against a team that struggles to put the ball in the basket. Generally, teams have found themselves able to score on the Falcons, with the exception of the Green Bay game. The boys have had some quality practice time, so hopefully our young guys will continue to play better defense. 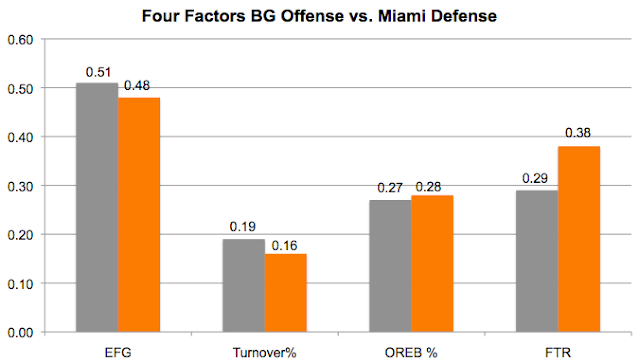 BG has had an effective offense and Miami's defense has been about the same. The NCAA average to date is 1.035 points per possession. These are the numbers of teams that are struggling. As you would expect from a team that lost their PG, the RedHawks are one of the 20 worst teams in D1 at taking care of the ball. They also don't get to the line. Their shooting is poor as well and they are about average on the boards. (Actually, it is pretty interesting. BG is #274 in overall defense, but except for turnovers, they are at or above the national average). The key issue for Miami is that they are #44 in trying 3FGs but #258 in making them. Hopefully, they don't find the mark against BG's 3FG defense, which is right at the national average. The RedHawks are also below average on 2FGs. As noted, things are different when you have BG has the ball. Miami is very good on the boards, which you would expect and they don't let teams get to the line. 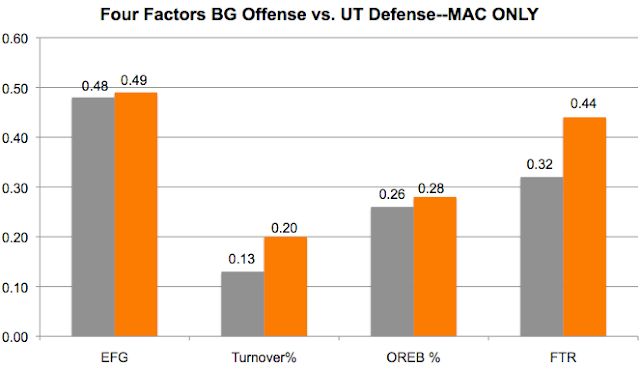 Also, they do force some turnovers and BG has been very good on that front. I'd say those two areas will be the key flash points. 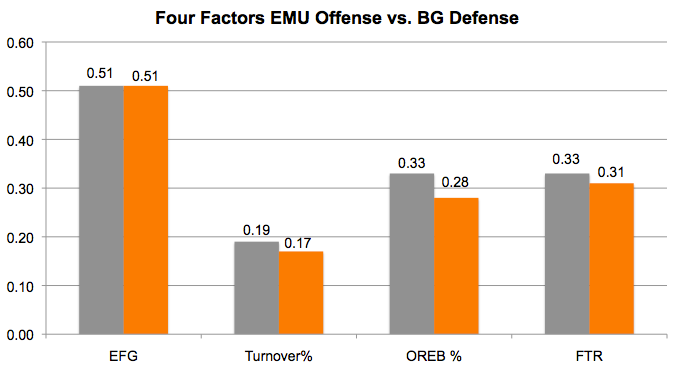 Note that BG's EFG% has been falling and is now below average for D1. Miami features one double figure scorer. Nike Sibandie. He's a true FR from Indianapolis. He scores 14 PPG but on 43% and 35% shooting. Their PG is Darrian Ringo, a JUCO transfer with 7.9 assists per game. That's #4 overall in D1 and that's for a low-possession team. Tempo-free he is #2 in the country. He is also #3 in the nation in steal %. Logan McLane at 9.6PPG and 52% shooting and 6.2 RPG (he's a senior) and true FR Jalen Adaway is scoring 9.4 PPG on 54% shooting and 5.8 RPG game. One last factor in this one. Miami played at OSU on Saturday, so they had a quicker turnaround than BG, who have not played a competitive game since they were in Green Bay. 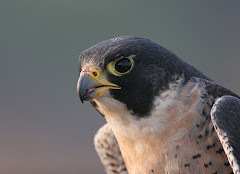 Happy New Year to the Falcon Nation...this is a natural day for reflection and re-energizing. Truthfully, nothing stops us from doing this every day, so maybe that's a good goal for 2018. Let the success and failure of the past go...as St. Francis said, " Let us begin again for until now we have done nothing."